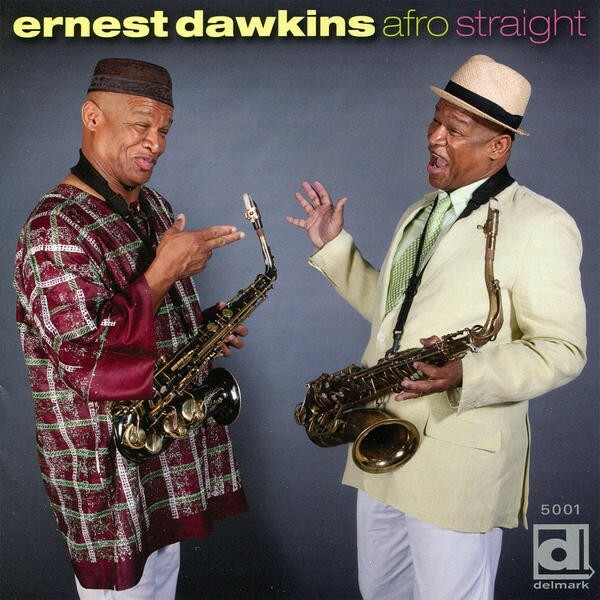 The premise of Afro Straight (Delmark), the sturdy new album from Chicago saxophonist Ernest Dawkins, is that his decades-long involvement with the Association for the Advancement of Creative Musicians has pushed him away from wading deep within the standard post-bop repertoire, focusing instead on original music and an exploration of disparate styles. "When I first came around the AACM [in the early 70s], that's what we were told to do: I saw guys like [Henry] Threadgill doing other gigs, playing shows, playing in church, as well as playing what we call 'AACM music,'" he says in Neil Tesser's liner notes. Dawkins has played in plenty of AACM bands over the years—the Ethnic Heritage Ensemble and most notably his own New Horizons Ensemble—but he's never veered too far from his muscular post-bop roots. Even when playing in free contexts, his sound never gets too far from a familiar saxophone legend—he's never been quite the iconoclast or innovator that forebearers like Threadgill, Muhal Richard Abrams, Anthony Braxton, and Roscoe Mitchell were. There's nothing wrong with that, of course, and Dawkins has made plenty of great music over the years. It's just that, repertoire aside, Afro Straight isn't radically different that many of his other recordings. Surrounded by a killer band a generation younger—trumpeter Corey Wilkes, bassist Junius Paul, drummer Isaiah Spencer, and pianist Willerm Delisfort—Dawkins tackles a strong selection of tunes associated primarily with John Coltrane and Wayne Shorter, along with some bebop warhorses like Dizzy Gillespie's "Woody 'N You." The performances are spirited, hard swinging, and don't shy away from the progressive streak that helped to distinguish Coltrane. The churning intro to "Softly As in a Morning Sunrise" gets a treatment that would've turned up on one of the saxophonist's early Impulse sides, with Delisfort recalling the forceful drive of McCoy Tyner. On a handful of tracks the band is joined by an assortment of extra percussionists, including Ruben Alvarez, and on a rendition of the Billie Holiday classic "God Bless the Child" Ben Patterson sits in on Hammond B3, injecting an extra layer of smoky soul. Dawkins and the core band on the new record celebrate the new release with a weekend engagement at Andy's Jazz Club on Friday and Saturday evening. Below you can check out the group's version of the Shorter gem "Footprints."